Thanks to the hard work of many different Apple II hardware developers, I sort of have way too many solid state storage products to review. (Who could possibly have imagined a sentence like that 10 years ago?) Each is going to get a very thorough review, but I’ve completed my SmartPort benchmark testing (as opposed to Floppy Drive emulation) of what I have, and thought it was interesting enough that it warranted sharing now. My speed benchmarks involve measuring the time it takes to boot into GS/OS 6.01 (with a few extensions), and the time it takes to start AppleWorks 3.0 with about a dozen TimeOut modules (AppleWorks loads itself entirely into RAM, as do several of the TimeOut modules), all coming from the same SmartPort hard drive image file (which is archived for future benchmarks of new devices). The benchmarks are run on a Rom 3 Apple IIGS with 5MB total RAM and a Zip GSX 8/64k, though the accelerator is disabled for half the tests as noted. The Floppy Emu is connected to both the built-in SmartPort controller, and then again via a SuperDrive controller card – I was curious if one was faster than the other. Multiple runs were timed for each benchmark, with the average time recorded in the table below. Results are color-coded horizontally: Dark Green is the fastest, Dark Red is the slowest, while light green, light red, or yellow are somewhere in-between. On first glance, the surprising result is that one product doesn’t win outright in all the benchmarks (which would be indicated by a vertical column of all dark-green cells), but here is where you should look closely at the very small difference in times. It seems that the original CFFA2 with a Compact Flash card formatted with native ProDOS partitions is the fastest way to boot GS/OS with an accelerated IIGS, and it is, but not by much. The very same CF card booting on the CFFA3000 is only 4% slower, while the same image file on a FAT32-formatted USB Flash drive is 7% slower, or one and a half seconds. Would you notice a 1.5 second difference in real-life? I don’t, so in real-world use, they feel about the same. At an unaccelerated 2.8 MHz, it’s basically the same story: only about half a second separates the CFFA combinations, though it is nice to see that an accelerator boots boot times by about 40%. For 8-bit software, the speed differences are more noteworthy. AppleWorks loaded more than twice as fast with the CFFA3000 than the older CFFA under acceleration. In fact, for anyone who vividly remembers working from floppies, the speed is startling – it’s basically as fast as booting from a RamFactor. At the default CPU speeds, the CFFA3000 is slightly less than twice as fast, but one thing is clear: the CFFA3000 is highly optimized for 8-bit software compared to its predecessors. Interestingly, the CFFA3000 was consistently slower, by a hair, when accessing drive images stored as .PO files on a FAT32-formatted USB drive compared to a ProDOS-native formatted Compact Flash card. I’m guessing there’s a translation layer on the card that adds a slight amount of lag when working with files-as-partitions instead of straight partitions. The simplicity of working with files instead of partitions with modern computers, however, more than offsets the very slight speed difference, in my opinion. The Floppy Emu, not surprisingly, trails the CFFA cards significantly in these speed tests. It connects to the Apple II family though the SmartPort floppy disk drive connector, and that’s significantly bandwidth-limited compared to an internal card-slot. Or to put it another way, the floppy drive connector is just a lot slower than a slot, so the Floppy Emu is always 3- or 5-times slower than the CFFA. That sounds like a lot, but in the real-world, it’s different. Yes, you can go fix yourself a cup of coffee in the time it takes GS/OS to boot from a Floppy Emu, but once it’s up and running, using GS/OS doesn’t really feel all that slower. Starting applications is a beat or two off, but it isn’t that bad. It’s probably faster than those old Vulcan and SCSI drives were back in the day, and it’s still way faster and more convenient than floppies. Interestingly acceleration doesn’t make as big a difference for the Floppy Emu as it does for the CFFA cards, and with 8-bit software, acceleration almost doesn’t matter. 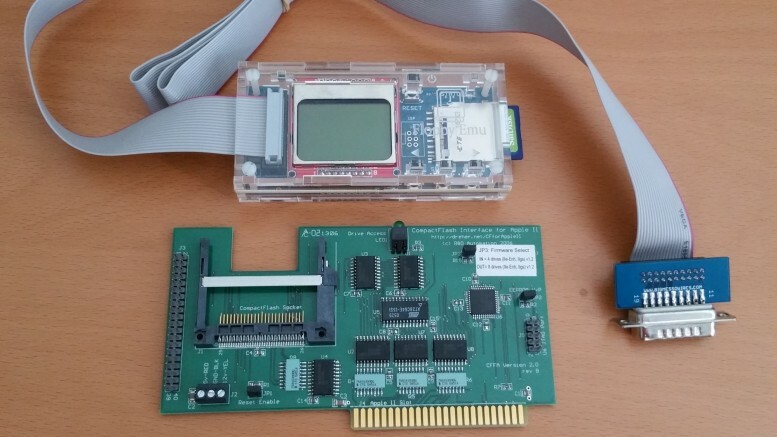 Stay tuned for full reviews of the CFFA3000 card and the Floppy Emu device.